The Monward Realty Company, headed by developer and realtor Lawrence B. Pierce, acquired lots at the northeast corner of Olive and Broadway streets in 1911 and 1912. Located in the heart of the financial district, the site was well-suited for a modern office building. Monward Realty company hired Eames & Young to design the new building, which would later be named the Marquette Building. The firm came up with a plan consisting of a U-shaped 19-story base and a 10-story tower with pyramidal cap influenced by New York skyscrapers of the era. The building blended rugged steel frame construction with Classical Revival exterior detailing in brick, stone and terra cotta. The tower was never built, and the base was completed in 1913. In 1914, fire destroyed the Boatmen’s Bank Building at Fourth and Washington, and the bank elected to lease the first floor bank space already built out. The brochure opens with a slightly ominous statement: “No name has as yet been given the building.” The building was known as the Monward Realty Building until 1914, when it was known as the Boatmen’s Bank Building. The name “Marquette Building” was bestowed by an owner in 1976. Pierce published the brochure to market the available office and retail spaces. Unlike the more detailed circulars for other office buildings, this publication has very basic information and mostly devotes its pages to floor plans. 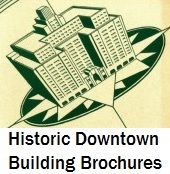 The brochure includes the rendering of building showing the unbuilt tower, and promises a completion date of November 1913. The brochure is not dated but likely was published in late 1912.